2 What is the problem? 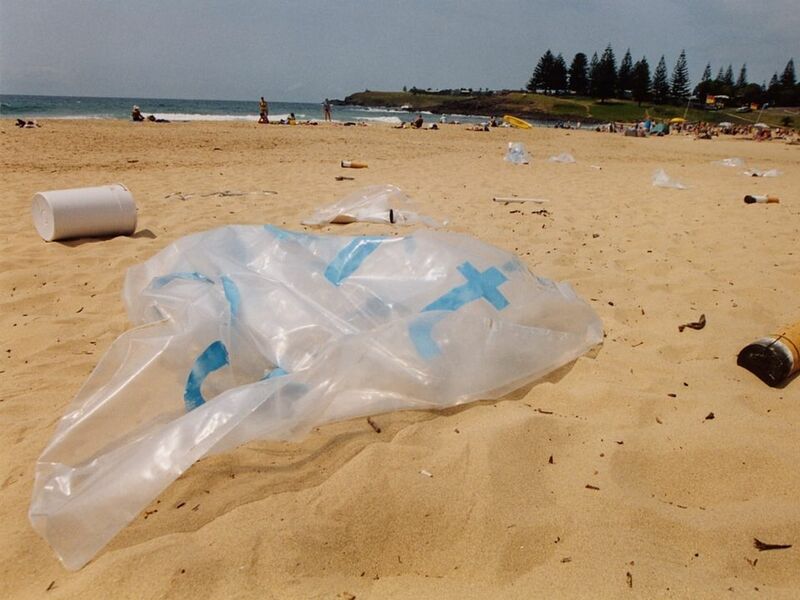 Australians dump 7,150 recyclable plastic bags into landfills every minute. 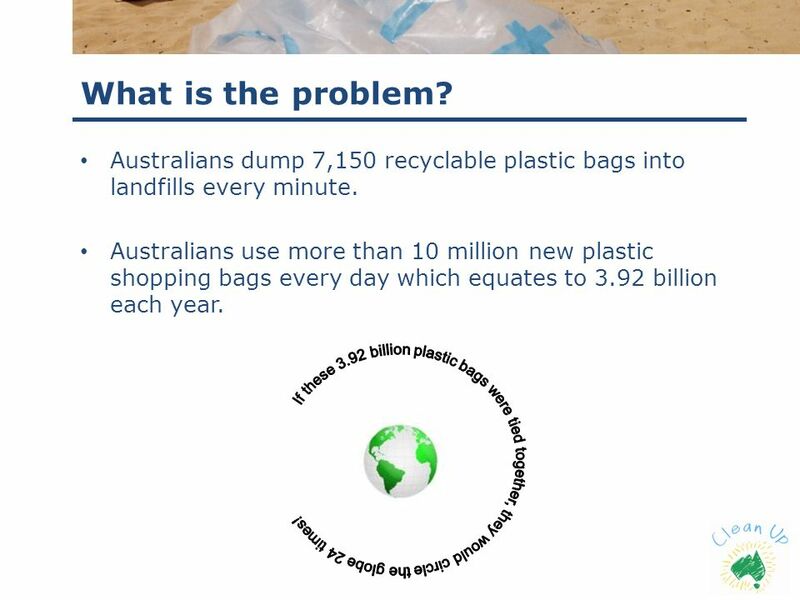 Australians use more than 10 million new plastic shopping bags every day which equates to 3.92 billion each year. If these 3.92 billion plastic bags were tied together, they would circle the globe 24 times! 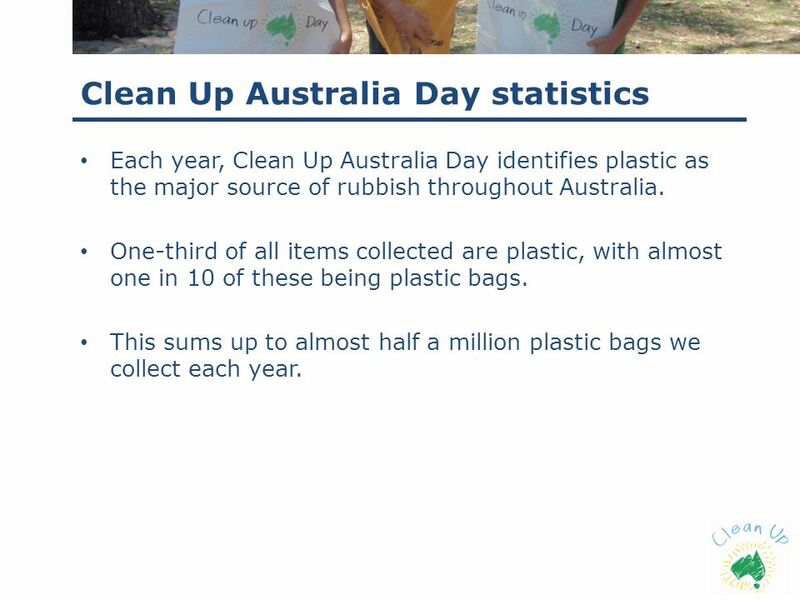 Each year, Clean Up Australia Day identifies plastic as the major source of rubbish throughout Australia. One-third of all items collected are plastic, with almost one in 10 of these being plastic bags. This sums up to almost half a million plastic bags we collect each year. 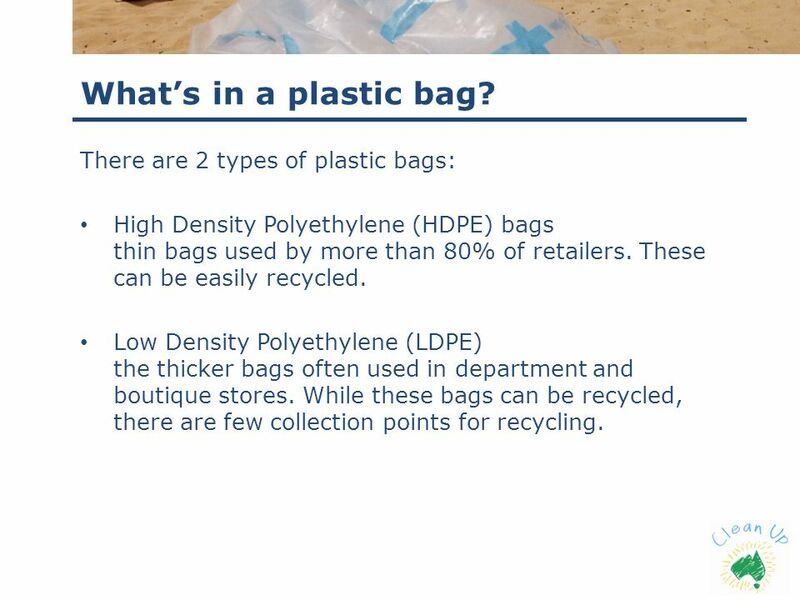 High Density Polyethylene (HDPE) bags thin bags used by more than 80% of retailers. These can be easily recycled. Low Density Polyethylene (LDPE) the thicker bags often used in department and boutique stores. While these bags can be recycled, there are few collection points for recycling. 7 What types of plastic bags? 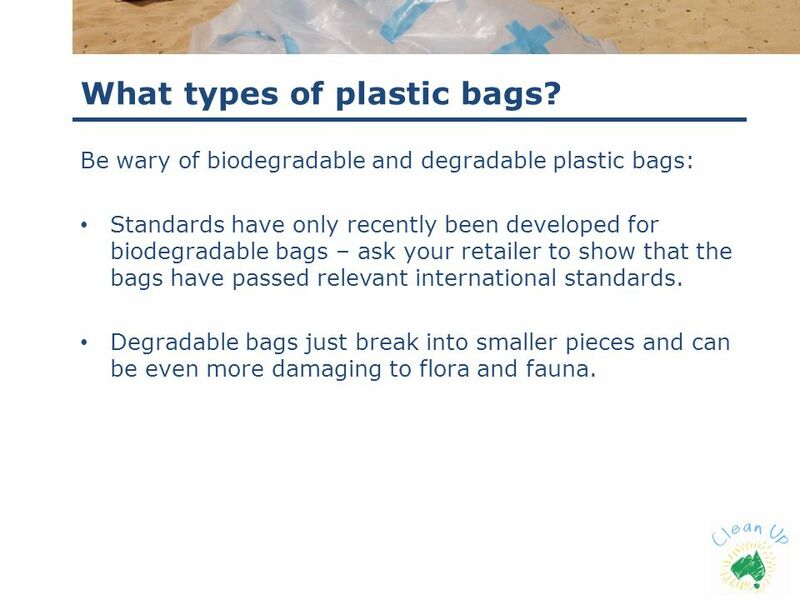 Be wary of biodegradable and degradable plastic bags: Standards have only recently been developed for biodegradable bags – ask your retailer to show that the bags have passed relevant international standards. Degradable bags just break into smaller pieces and can be even more damaging to flora and fauna. 8 What’s the effect on the environment? 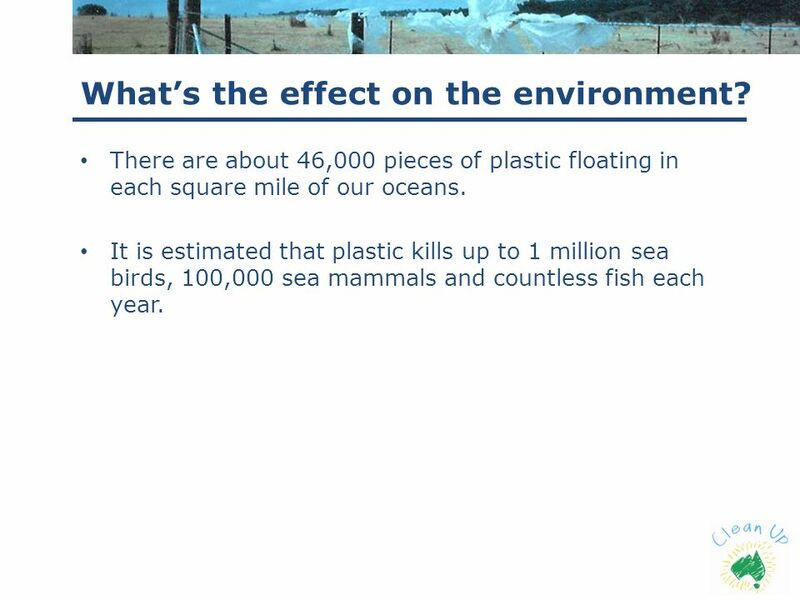 There are about 46,000 pieces of plastic floating in each square mile of our oceans. It is estimated that plastic kills up to 1 million sea birds, 100,000 sea mammals and countless fish each year. When oil, gas and coal are used to produce plastic bags, they emit dangerous greenhouse gasses. The burning of gasses also creates emissions of toxic gasses, dioxins and heavy metals. Bags escape and float easily in air and water, travelling long distances. 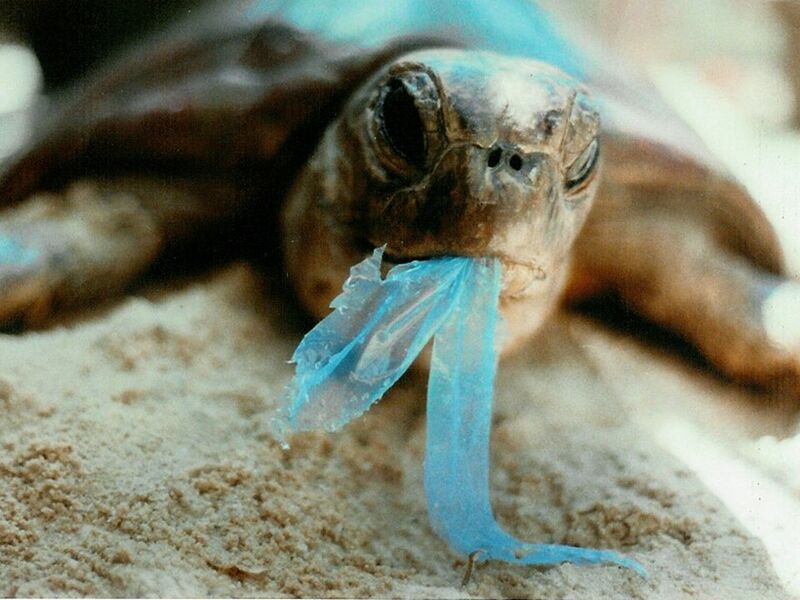 When animals which have ingested bags die and decay, the plastic is free again to repeat the deadly cycle. 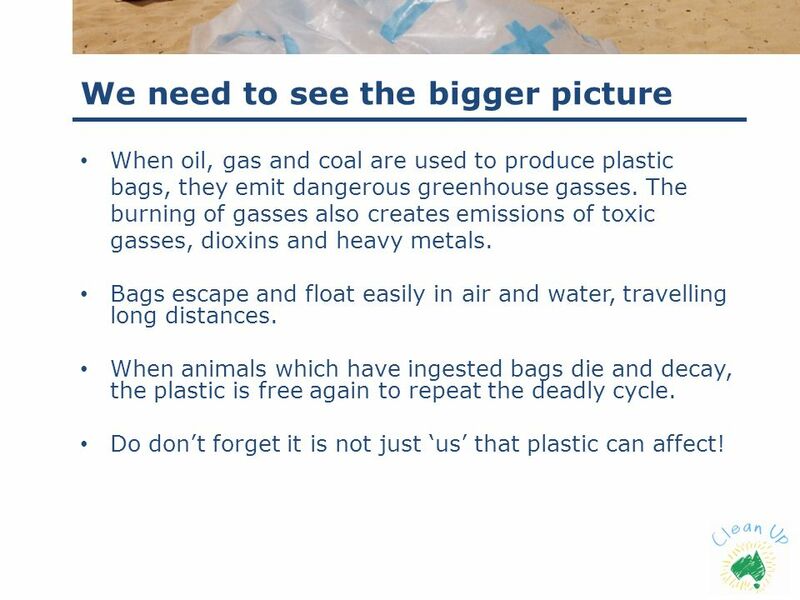 Do don’t forget it is not just ‘us’ that plastic can affect! 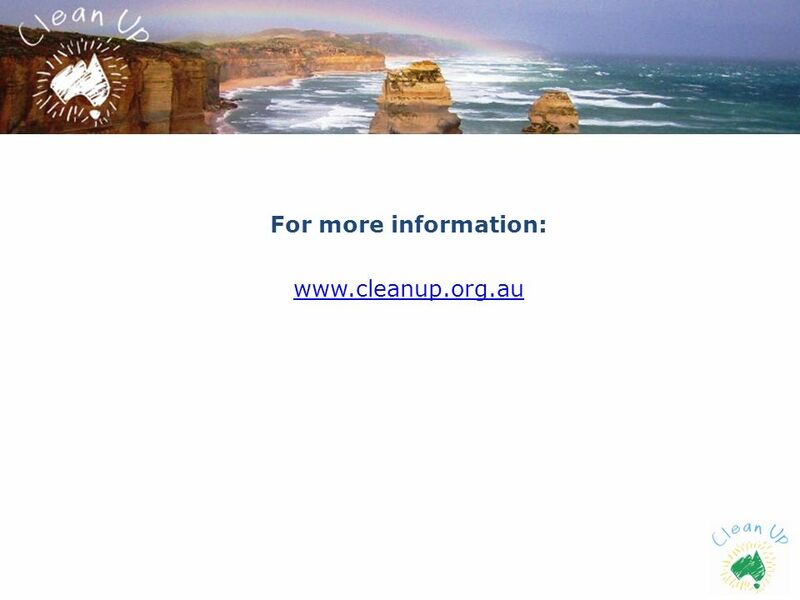 11 What does Clean Up Australia do? CUA lobbies for a complete national ban of single-use plastic bags. 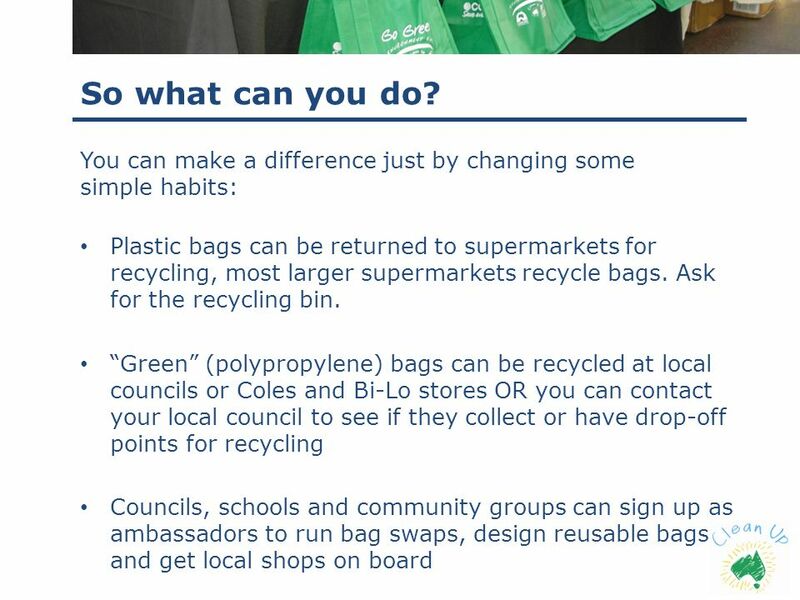 SA recently banned lightweight plastic check out bags – CUA urges all Australian states to follow. CUA attends various government meetings including the Environmental Protection Heritage Council and urges government to address the issue of plastic bags. 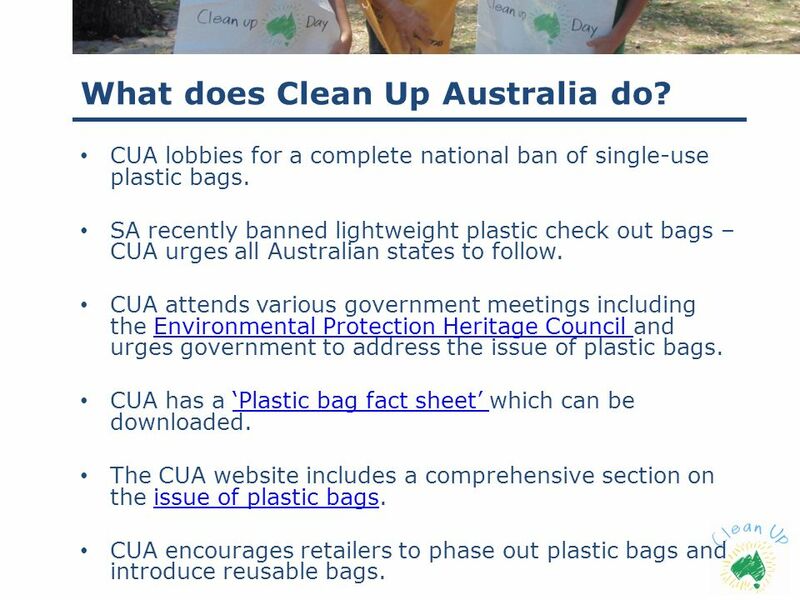 CUA has a ‘Plastic bag fact sheet’ which can be downloaded. 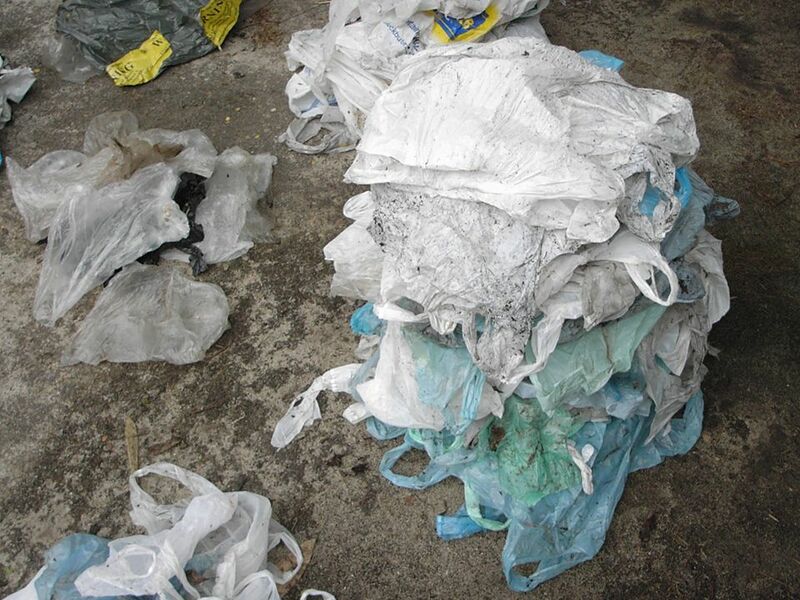 The CUA website includes a comprehensive section on the issue of plastic bags. CUA encourages retailers to phase out plastic bags and introduce reusable bags. 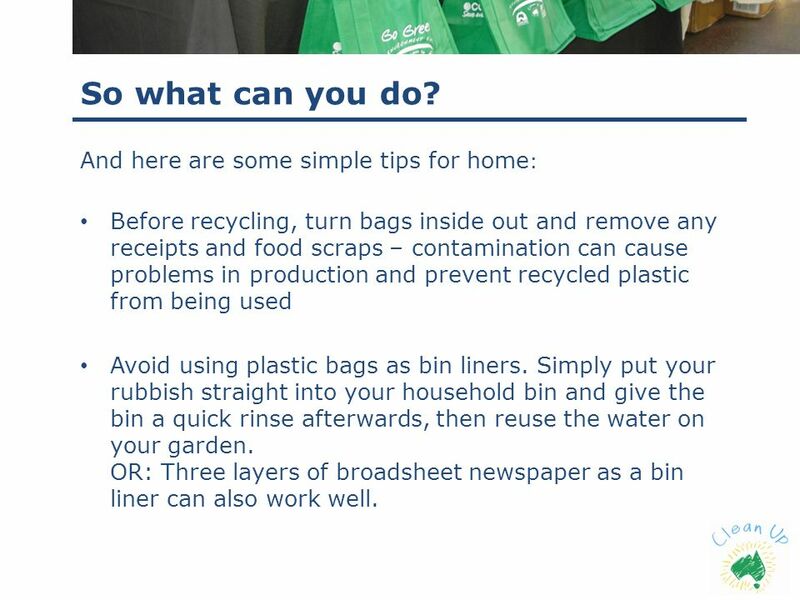 Before recycling, turn bags inside out and remove any receipts and food scraps – contamination can cause problems in production and prevent recycled plastic from being used Avoid using plastic bags as bin liners. Simply put your rubbish straight into your household bin and give the bin a quick rinse afterwards, then reuse the water on your garden. OR: Three layers of broadsheet newspaper as a bin liner can also work well. Download ppt "an awful load of rubbish"
Maryland Clean Boating Lesson Plan Section 3 WASTE CONTAINMENT AND DISPOSAL. WELCOME TO OUR PRESENTATION YOUR RUBBISH KILLS!. Our school project STEP 1 Heatley Secondary College is in the catchment of Louisa Creek. We work on Louisa. Do Your Part Be Smart Go Green. Sustainable Living Save Earth Say No To Plastic Presented by Kavita Praskash Nalawade PBHS. Waste Management By Ms Giveen Stage 5 Geography 2013. REDUCE, REUSE, RECYCLE By: Barry. 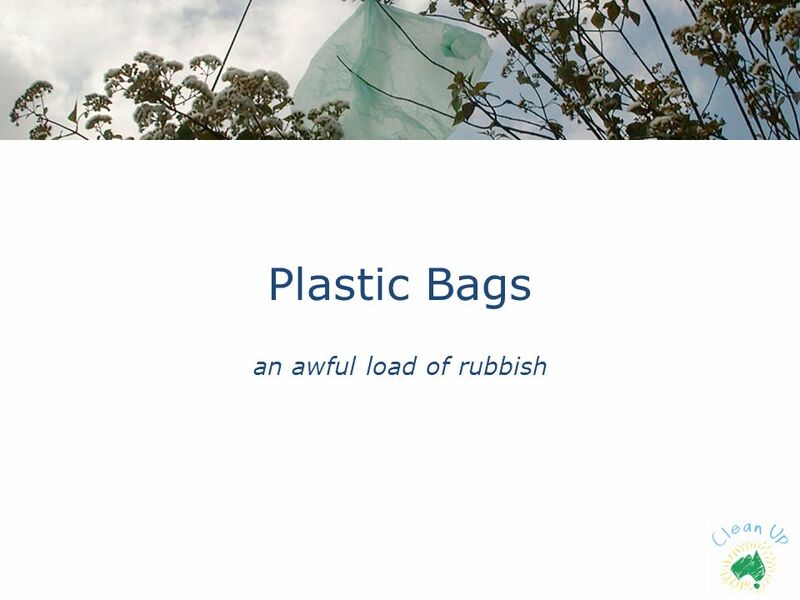 Plastic Bags - an awful load of rubbish.. What’s the problem? Saving The Planet By: Carlos P.. What is Global Warming? – I believe that global warming is caused by the toxic fumes of smokers, car exhausts, factories. Facts and figures. A load of rubbish Over 30 million tonnes of litter is collected from our streets every year. Over 2 million pieces of rubbish are dropped. “Environmental Friendly” PROMOTING BIODEGRADABLE PLASTIC BAG. Toxic Plastics --- Fact or Myth?  After many months of study, a ban on the distribution of non-biodegradable plastic carryout bags has been proposed. 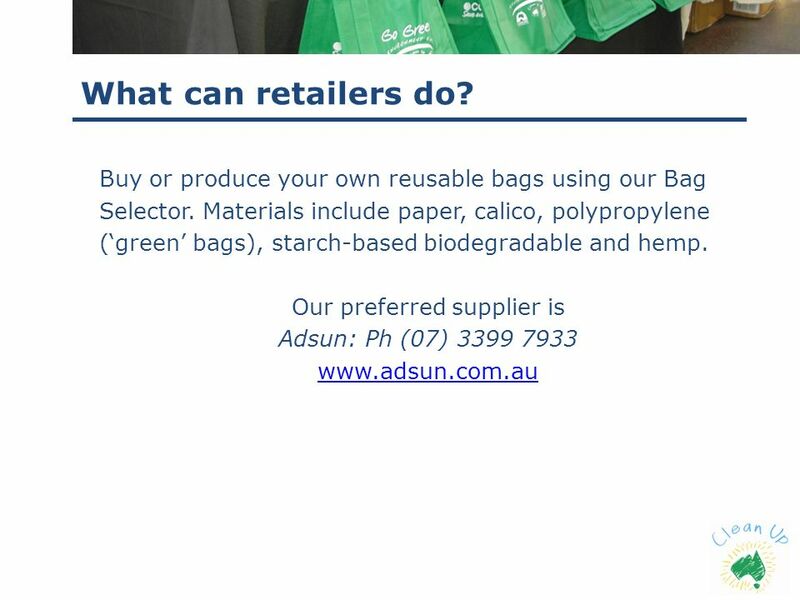  These bags are typically made. Plastic bags filling up the landfill By Tamzyn & Charlotte. Wheelie’s Workshop learn and think Wheelie Big Actions research and act Wheelie Big Competition report, display and win! 5/6 Waste Audit 4 th March On the 4 th March, 5/6 conducted a waste audit of Baradine Central School. This involved collecting the rubbish from. Slide Information (Not to be posted with bulletin board) Thanks for using these pre-made slides! You can obviously change the design of the slides and. Plastic Is Poison By Layal Barakat. G 7E Qatar Academy. People and Planet Earth. Environmental problems endanger people's life The word environment means simply what is around us.